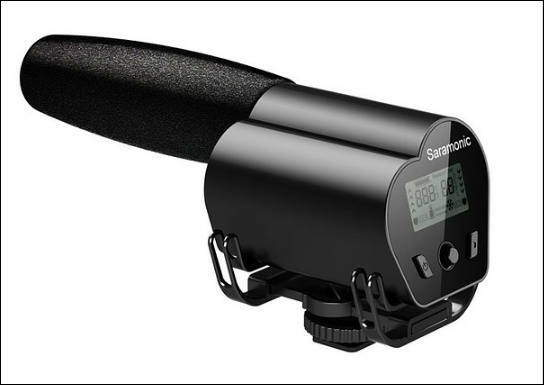 Saramonic VMic Pro is a super directional shotgun microphone that mounts directly onto your camera. Comes with shock mount system. It has 150 Hz low cut filter and a high frequency boost (+6dB) feature that can be controlled independently. Microphone comes with three position level control (-10dB, 0dB, +20dB), a 3.5mm headphone jack for audio monitoring, and a low battery LED indicator. The microphone's frequency response is 35 Hz ~ 20 kHz, signal-to-noise ratio is 75dB, and the microphone has a dynamic range of 120dB. Power is supplied by two AA batteries and the package includes a foam windshield as well as a detachable 3.5mm cable to connect to the camera. VMic Recorder model features an integrated flash recorder that can store 16-bit / 48 kHz WAV audio files to a Micro SDHC memory card up to 32GB capacity. It also comes with an LCD monitor and a single-button recording function. The standard VMic model comes with similar specifications to the Pro variant but has to make do with a slightly reduced feature set. It will set you back $119.95; the Recorder is $199.95. VMiv Pro UK will cost you £199.14.